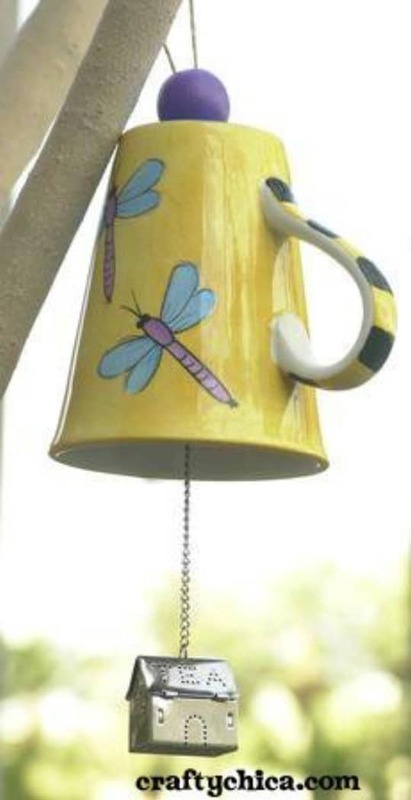 This ceramic or china tea pot wind chime idea is wonderful. I love the look of vintage tea pots in general, and especially when they’re hanging on the porch and offering beautiful melodies when the wind blows. This one is really easy, too. 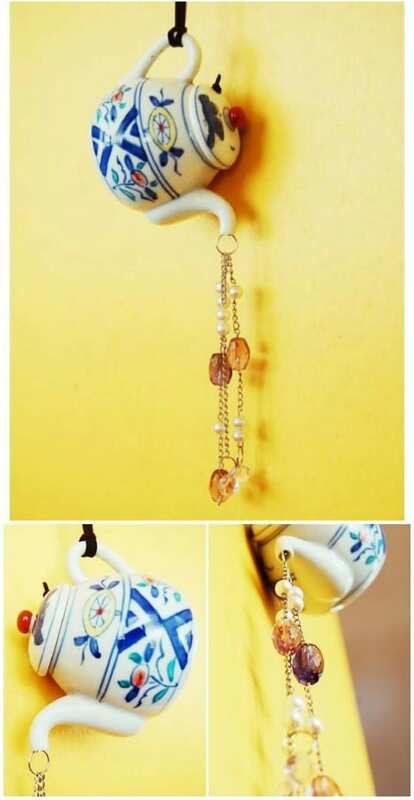 You just take that tea pot and hang beads, rings, or other trinkets from the spout and then hang it up via the handle. 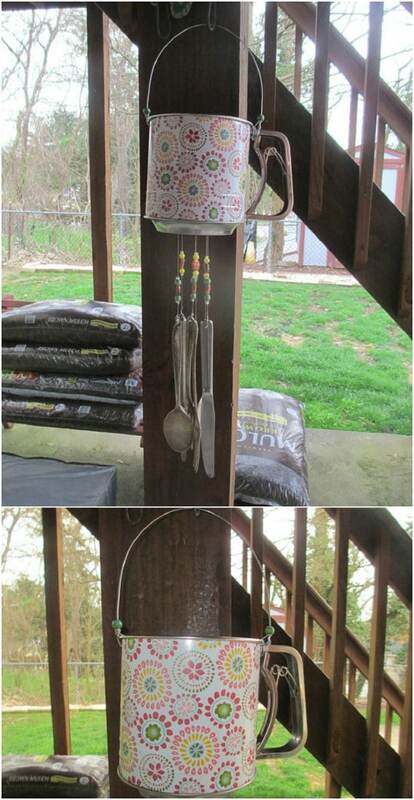 Those metal cookie cutters will really come in handy when it comes to creating rustic wind chimes. 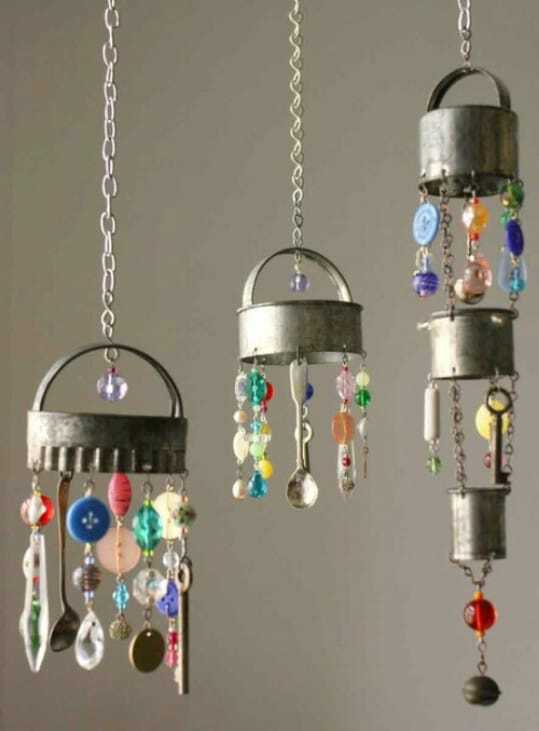 This is a wonderful way to use up some of those old metal kitchen pieces and get a beautiful decoration at the same time. 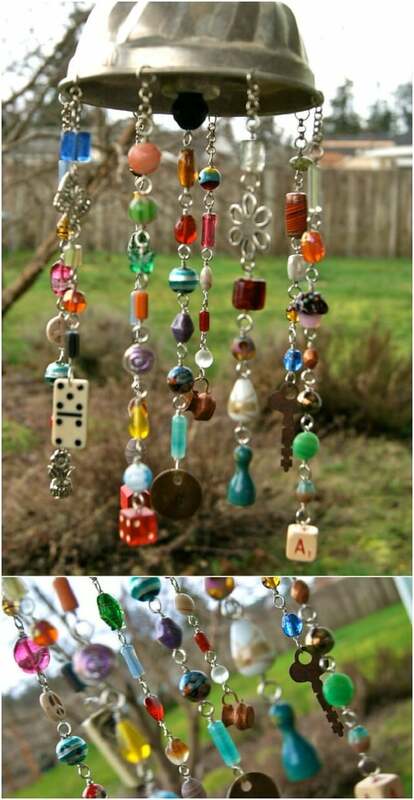 Just hang wire from the cutters and add beads and other trinkets to give them a wonderful sound. 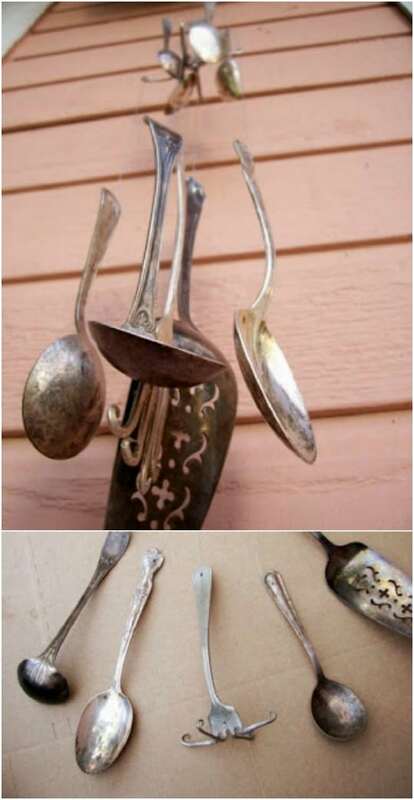 You could also use small silverware or other kitchen accessories that have a nice vintage look. 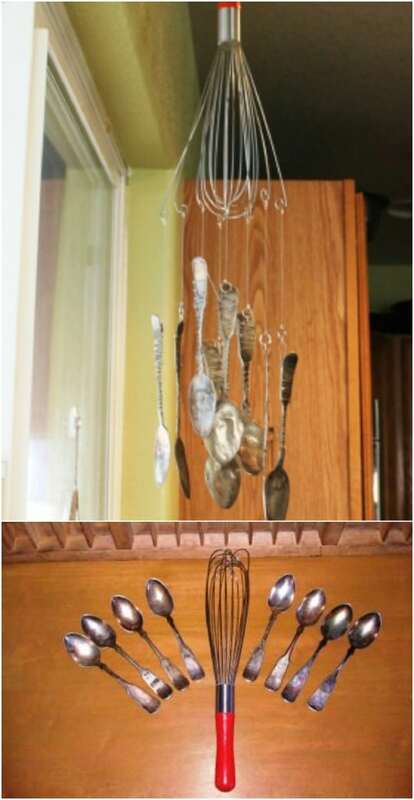 An old whisk – or a new one if you prefer – and some silverware make a wonderful wind chime for the kitchen or the back porch. 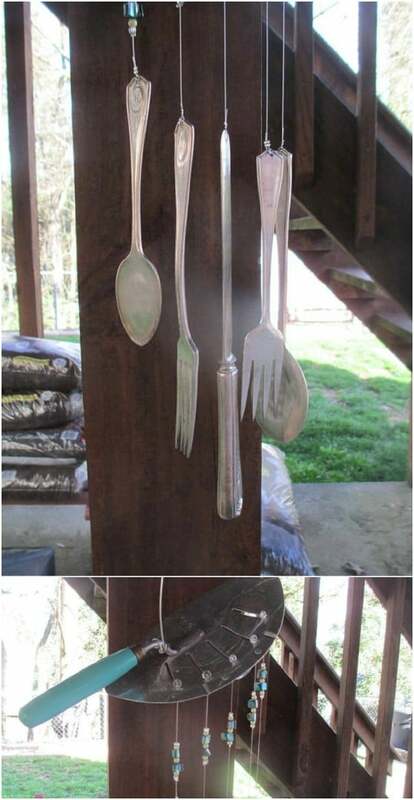 Just hang some fishing line from the tines of the whisk and attach your spoons, forks, and knives. 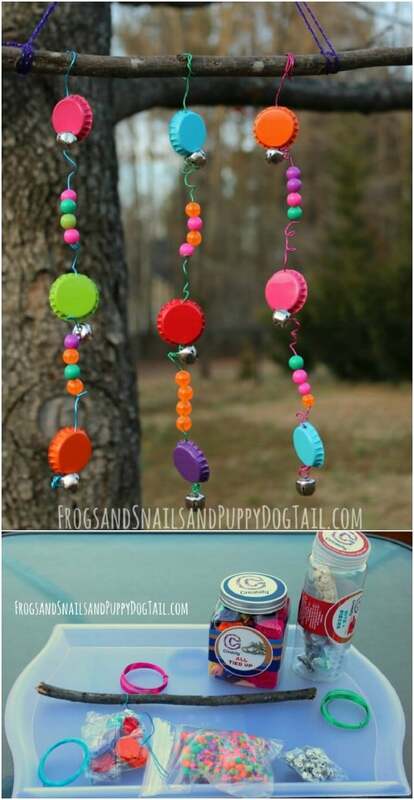 You could also add beads to the line if you want a more decorative look. 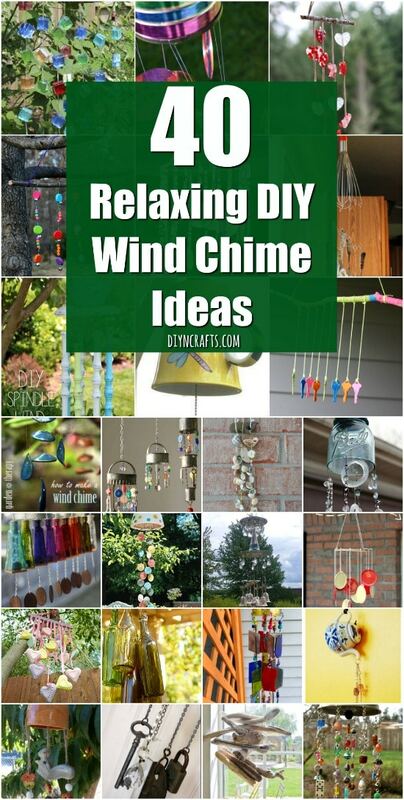 This is one of the easiest DIY wind chimes on the list and it’s one of my favorites. 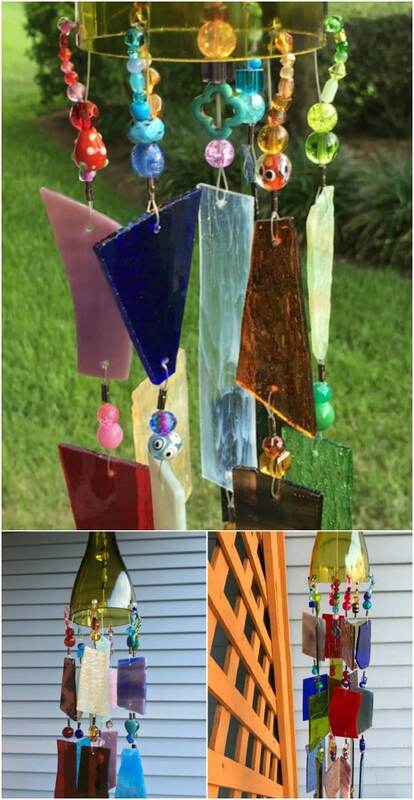 You can use wine bottles to create a beautiful wind chime and without having to cut them in half. 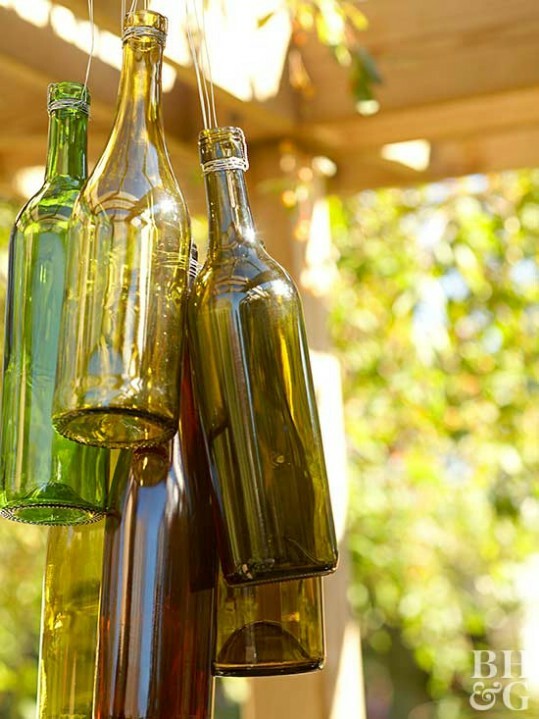 Just tie them all up together and when the wind blows, you’ll have a wonderful sound from the bottles gently clinking together. You tie them together with wire around the spout and you can add as many wine bottles as you have on hand. 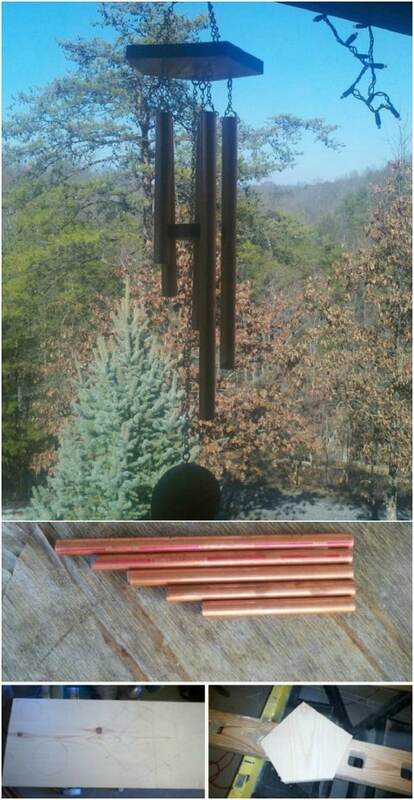 I have a rather large copper tubing wind chime that I bought a few years ago. Let me tell you, it wasn’t cheap. I really wish I had seen this DIY version earlier. 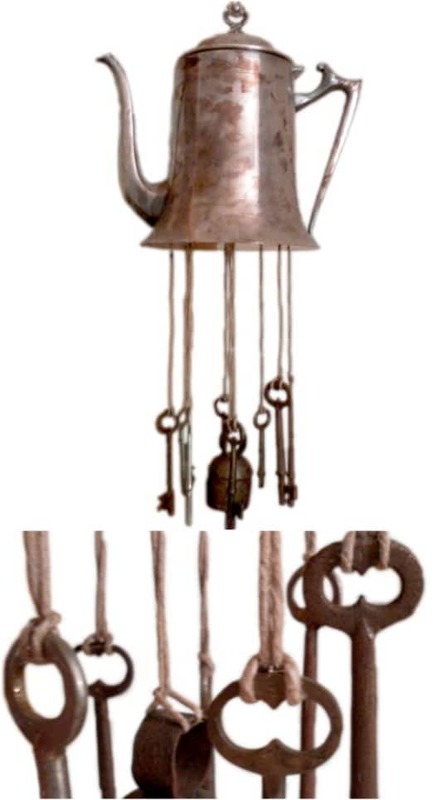 You’re still going to have to pay for copper tubing, unless you have some on hand, but this is a much less expensive option than buying a copper wind chime outright and it lets you customize it however you want. Plus, copper clinking together when the wind hits it is the most relaxing sound in the world. 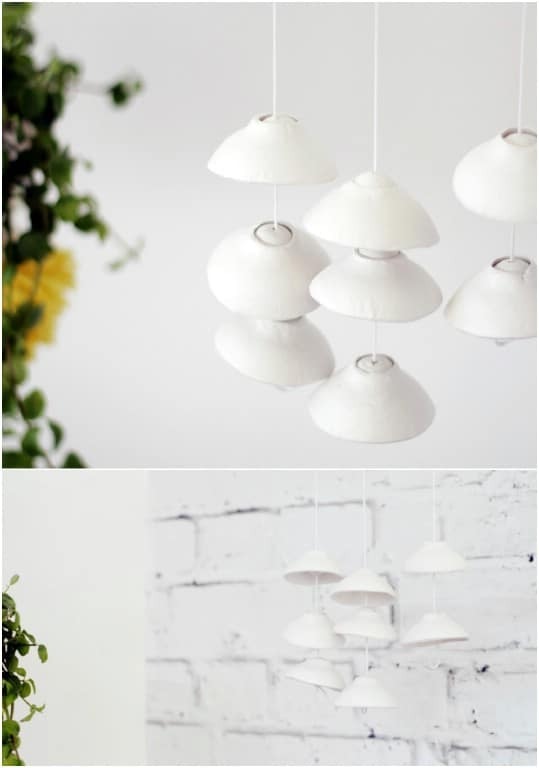 This wind chime is made from ceramic stone figurines and it’s great. You can pick up figurines like these at the Dollar Store. 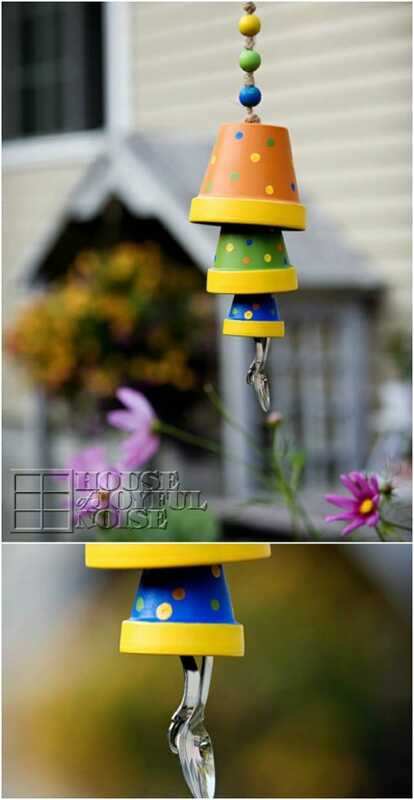 Then you just drill a hole in them and hang them from a ceramic planter with rope or twine. Or, you could just grab this one that I found on Etsy – it’s already done for you. 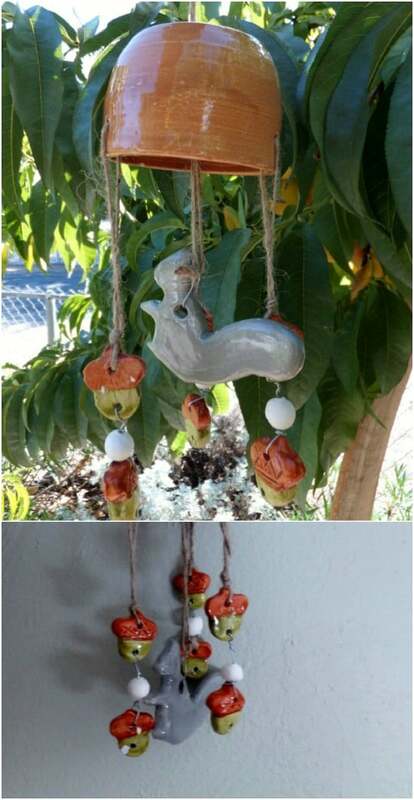 It has a little ceramic squirrel with acorns and you can get it for under $40 – and it’s all completely handmade. 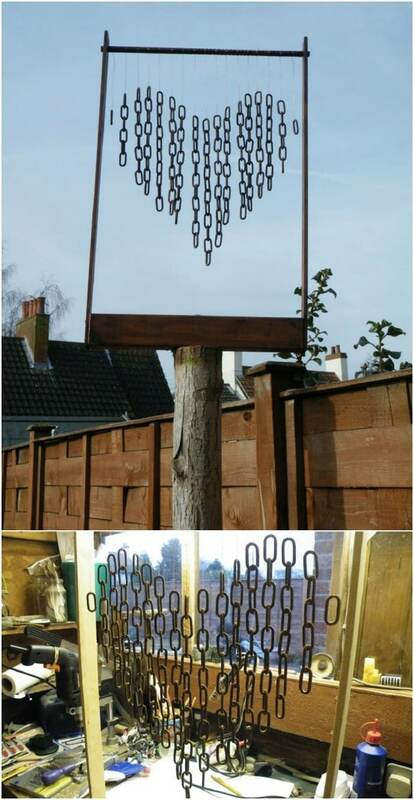 Here’s another great project that the kids can help you with. 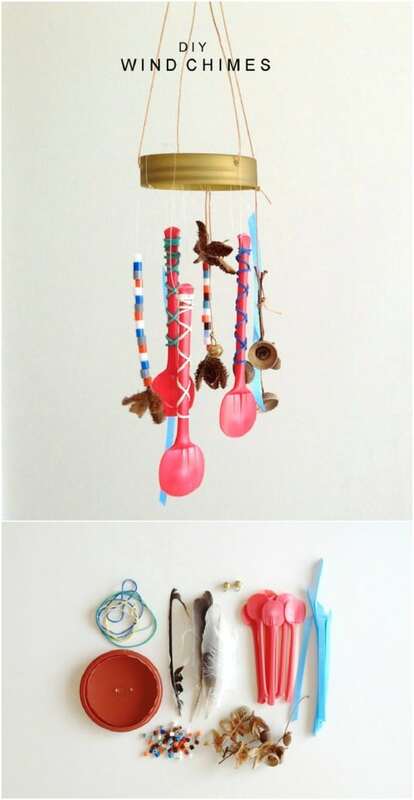 This wind chime is made out of repurposed ice cream spoons and it’s adorable. You’ll need a soft plastic lid for the base along with a few ice cream spoons and small bells, feathers, beads and other decorations. Kids will love helping to craft and customize this one and you’ll love the look and the sound of it when it’s finished. 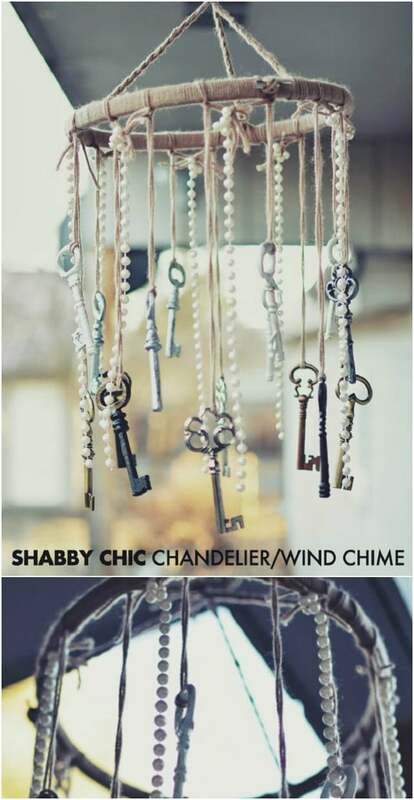 Silver goblets are beautiful and add so much elegance when you use them for décor, even when you use them for outdoor décor like in the case of this wind chime. The goblets make a wonderful sound when the wind hits them and they brush against each other. This is a really simple project and you can often find these old goblets at thrift stores and yard sales for around $10 a set. Just create a base and then add your goblets and maybe a few beads or other decorations. 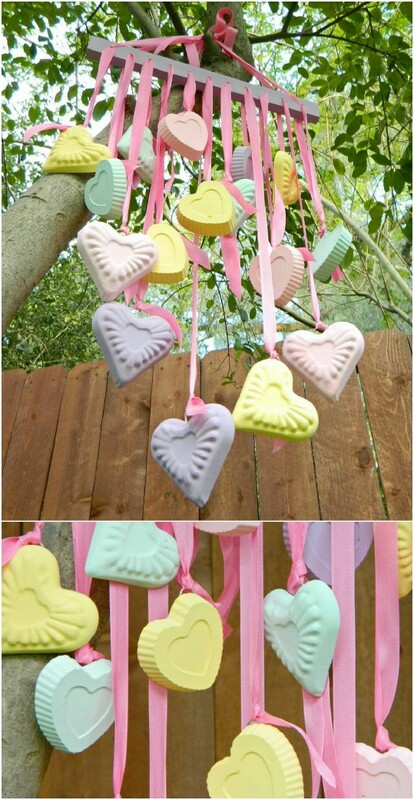 These aren’t real candy hearts, but they sure do look like those favorite Valentine’s Day candies. You make them yourself and you could even add little messages so they really look like conversation hearts. 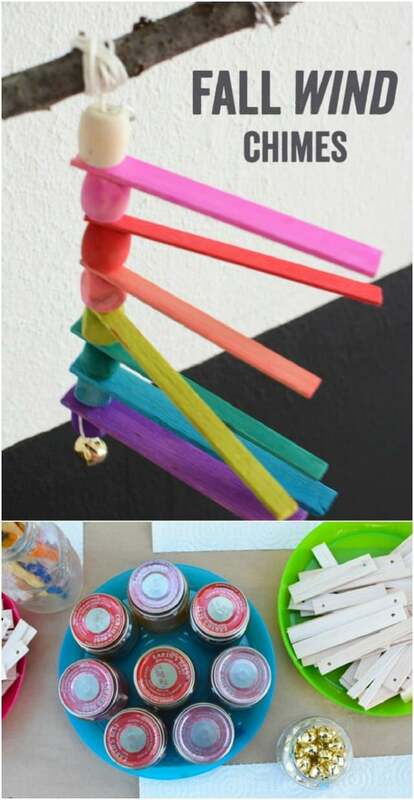 I love how adorably colorful and cute this one is and it’s a great project for the kids on rainy days. 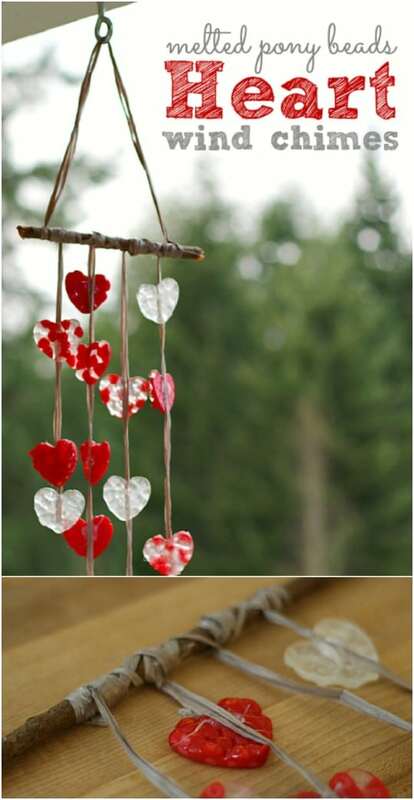 When the hearts are set and dry, just tie them all together with a ribbon or some twine and hang. 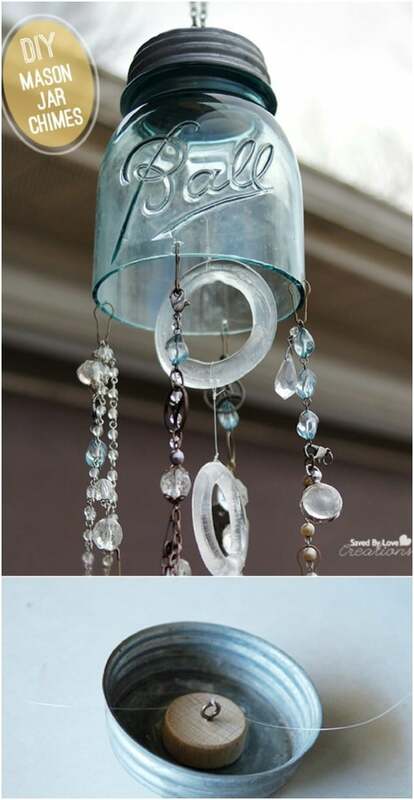 This beautiful glass domed wind chime is Japanese inspired and it’s absolutely gorgeous. 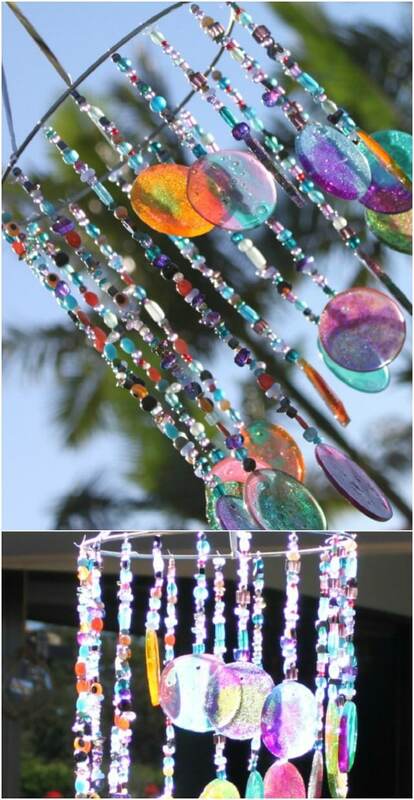 You’ll need a glass dome that you turn upside down and then use nylon thread or fishing line to attach wood and crystal beads. It gives off the most beautiful melody when the wind hits it and it’s really easy to put together. 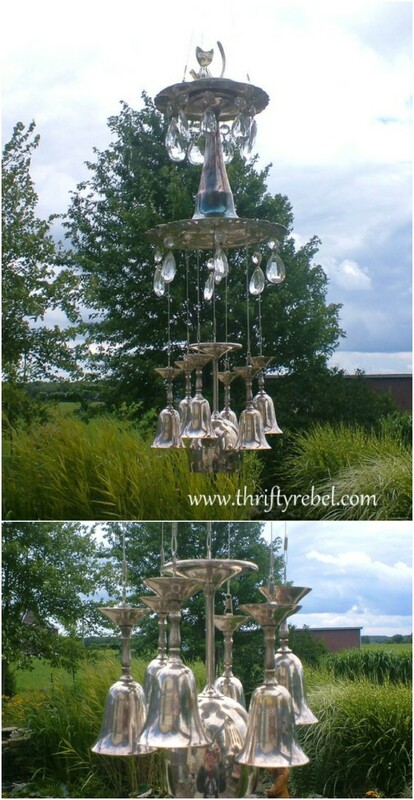 Make a few of them and line them up on your porch or deck for an elegant look and sound. 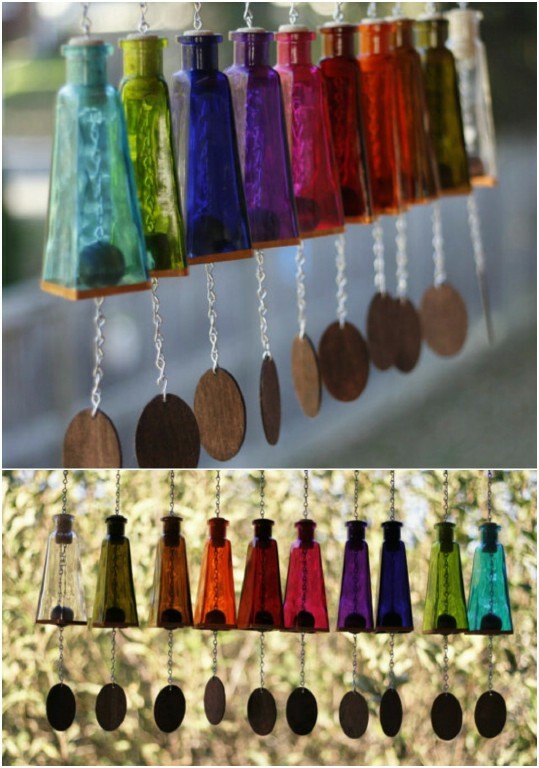 This colorful wind chime is perfect for fall – or any other season, really. It’s made from balsa wood strips which you can get at any home improvement store. Just punch a hole in one end and then paint them any combination of colors that you want. You could also stain them for a more natural look. 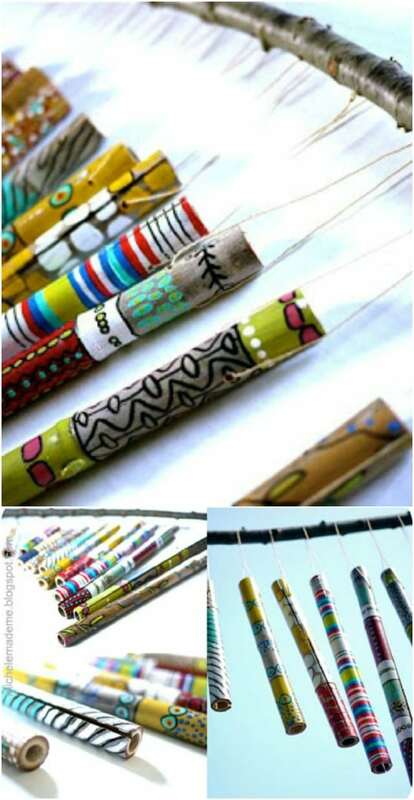 Then you separate them with wooden beads and hang them from a piece of wood. 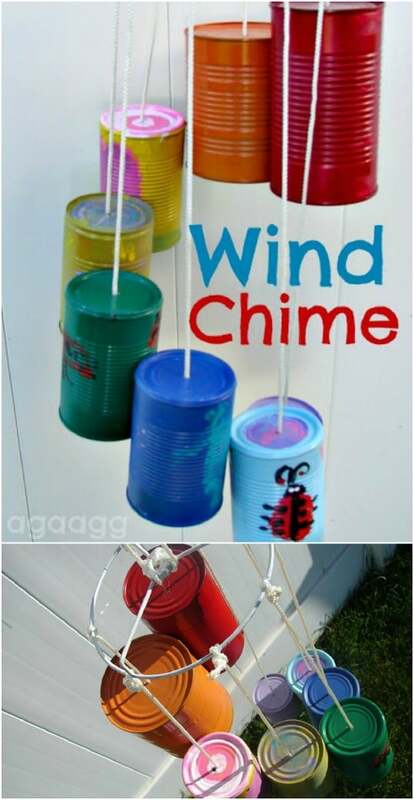 You can even add a little bell if you want extra jingle when the wind blows. 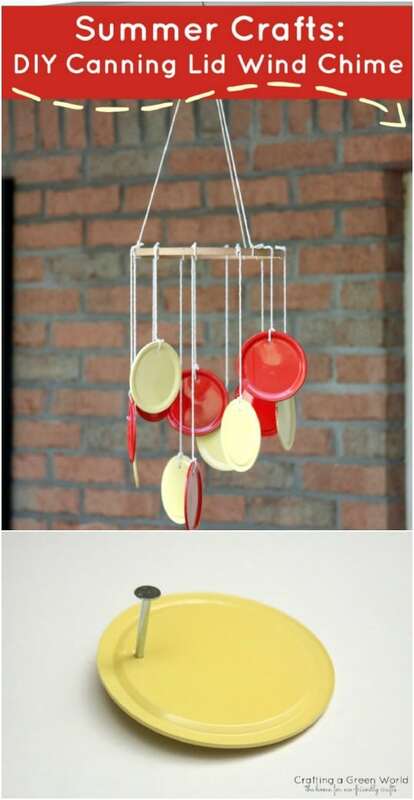 Those plastic eggs that you always have left over from Easter can be put to great use with this plastic egg wind chime. 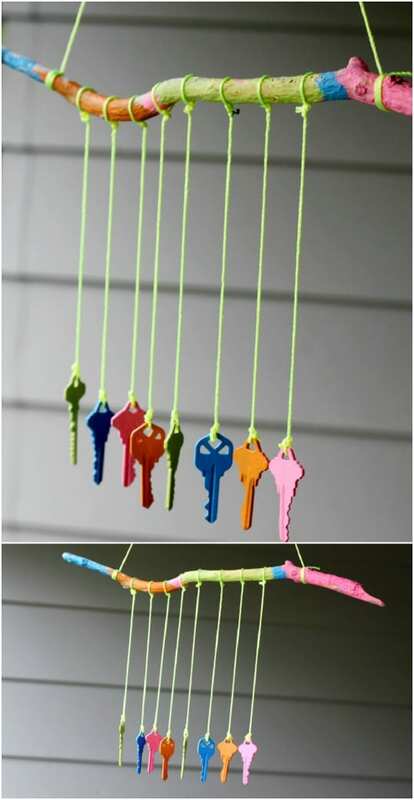 Kids will adore making this one and it’s really easy to put together. 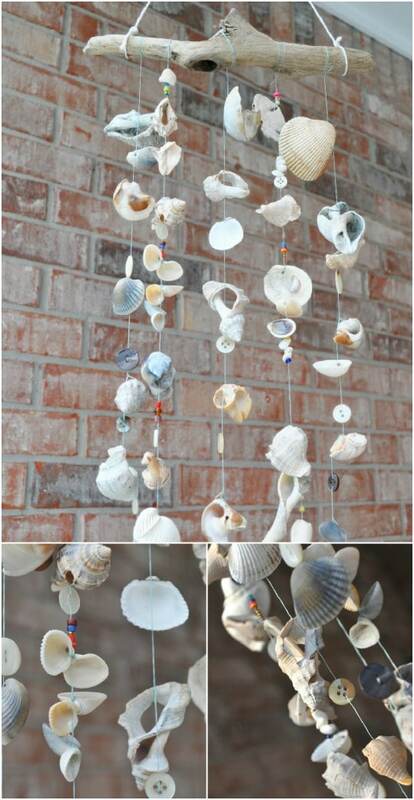 This Anthropologie inspired wind chime looks like a fish and has a wonderful sound when the wind blows against it. 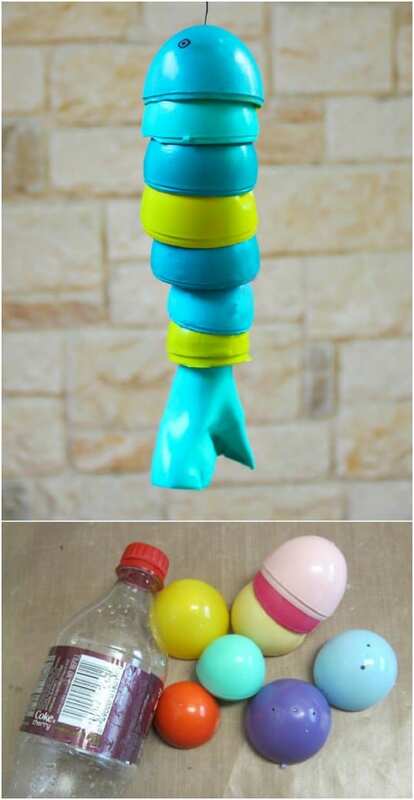 You’ll need a plastic soda bottle, a handful of plastic eggs and some paint to create it. 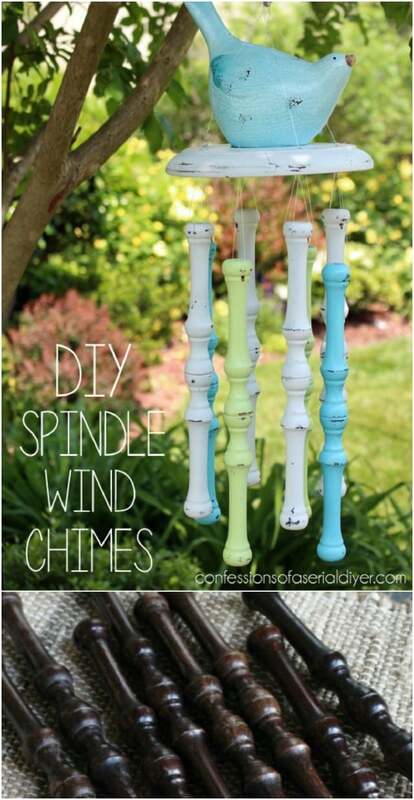 If you love the sound that wooden wind chimes make then you will really love this spindle wind chime that you can easily DIY. 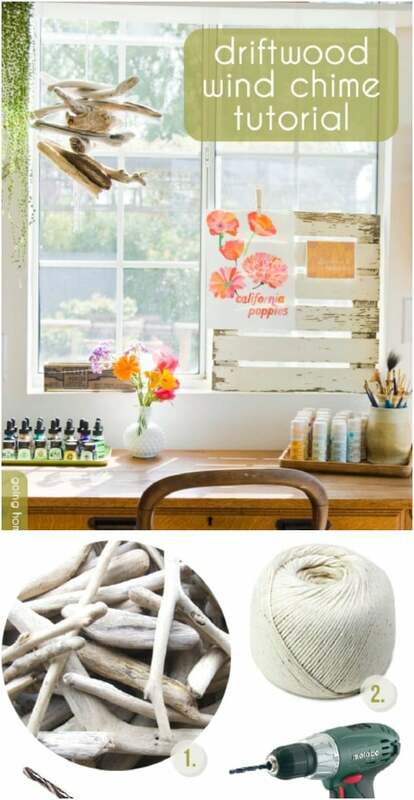 You’ll need old spindles which you can upcycle from a chair or baby crib, or you can normally buy these pretty cheap at flea markets and such. 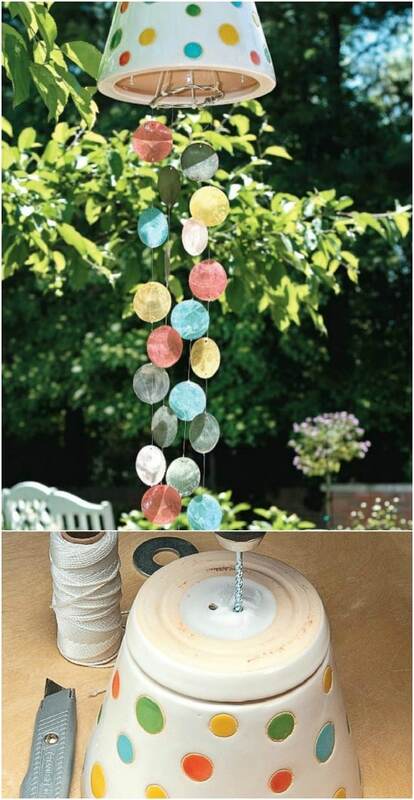 This is a really simple project and leaves you with a wind chime that looks as lovely as it sounds. 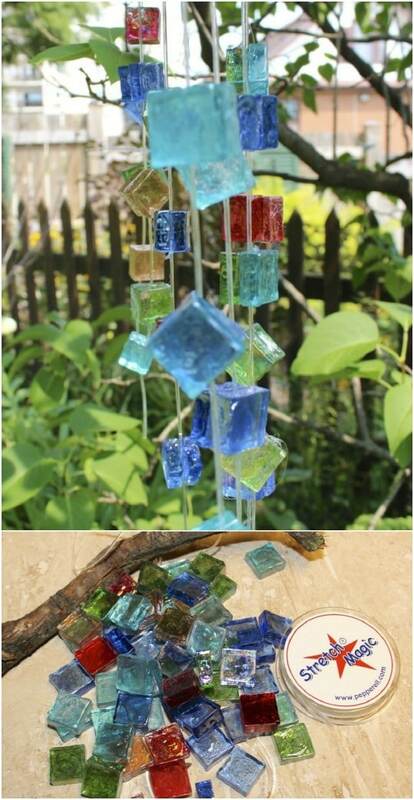 These gorgeous glass wind chimes are made from pyramid bottles and they sound wonderful when the wind hits them. 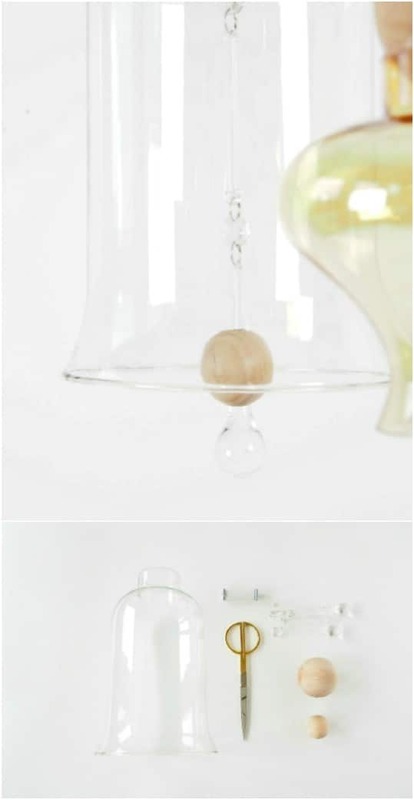 The wooden ball inside the glass bottle gives it that wonderful sound. 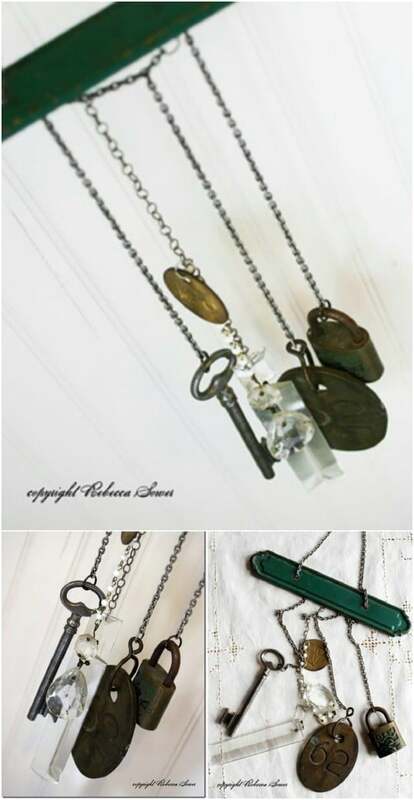 I found these on Etsy and they’re made from pyramid glass bottles, sort of like those old decorative bottles with dried flowers in them from the 1990’s. You can pick these up for less than $20 each and they come in a wide range of colors. 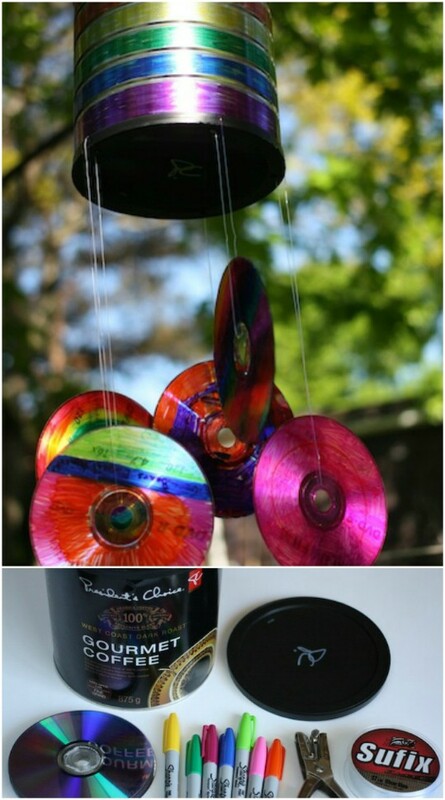 An old coffee can and some old CDs make a wonderful wind chime. This is a great kids’ project and it’s really easy to build. Just let the kids decorate an old coffee can and some old or empty CDs with sharpies. Then use fishing line to attach the CDs to the coffee can and you’re all set. This gives off a lovely sound and it’s the perfect project for those rainy afternoons. 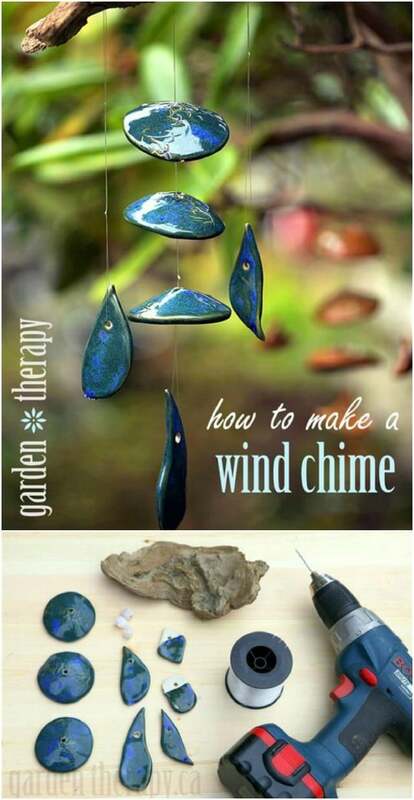 You can make your own clay wind chimes with some air dry clay and a mold. For this one, you can use a plastic wine glass to mold the pieces. Once they’re finished and dried, you just string them all up together and they make a wonderful sound when in the wind. They’re lovely when finished and you can paint them if you want to create a more unique color – make several and have them hanging all over your porch. Should it sound or play some tune…. ?